A German medical instruments manufacturer is finding oil mist extraction easier than ever after upgrading its filter system. 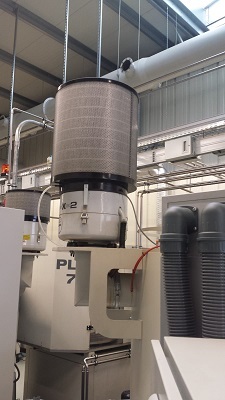 HIPP Medical AG switched to a Filtermist S Fusion filter to remove oil mist from a Hawemat 2001, a machine which is used to grind drills and rotating components, following a recommendation from one of Filtermist’s German sales team. HIPP Medical AG has been a Filtermist customer for the past decade – the company uses a number of Hawema machines which are all supplied with Filtermist units and standard afterfilters. The customer reported that the standard afterfilter on this particular machine was getting blocked up quite quickly due to the high volumes of oil mist produced in the operations involved. Filtermist recommended trialling one of its Fusion filters instead to see if this made a difference. S Fusion combines large volumes of high-tech synthetic filter media with Filtermist’s proven centrifugal technology. The filter was designed to cope with high volumes of submicron oil mist particles generated in applications involving high pressure, high spindle speeds or heavy cuts. This type of application can atomise neat oil and soluble coolant into thousands of submicron particles which can quickly block up traditional filter cartridges, causing unnecessary down-time. Subsequent field tests proved that Fusion filters can last up to six times longer* than standard afterfilters in some applications. This means the filters need replacing less frequently - reducing maintenance costs for customers. The Filtermist representative inspected the inside of the Fusion filter after it had been in operation for a few weeks and reported that it still looked brand new, with no obvious coolant residue. Dominique Ullmann, National Sales Manager for Filtermist in Germany, comments: “The system has been running for a while now with no problems and the customer is very satisfied with it. We would definitely recommend other companies within the medical sector consider using S Fusion filters. Fusion filters are compatible with S400 and S800 Filtermist oil mist filters and can also be fitted to S200 and FX4002 models using specially designed adaptors. Visit https://www.hipp-medical.com/en/ for more information about HIPP Medical AG, or to find out about how Filtermist could help your business, contact your local Filtermist distributor or email sales@filtermist.com.